TITLES ARE ONLY CONFIRMED ONCE PAYMENT HAS BEEN MADE IN FULL. Notice: In the event the winner of the drawing MAAU(TM) will offer that delegate the option to choose to represent the state she lives in or she may pick a regional title. $45 entry fee reserves your city/county title. Each city/county delegate will get a local sash representing their title. (no crowns will be awarded for city/county titleholder. *Please note that it may take up to 4 weeks for your sash to arrive from the vendor, so if you wait to enter your sash may arrive after the deadline or after the state winners have been announced. Each delegate (applies to all divisions.) MUST submit the following. Each part of your entry is worth 50 points for an overall total of 100 point. The person with the highest point score per division will be the state winner and will advance to the National Pageant. 1. Platform statement: 100 words or less about your platform and why you picked it. 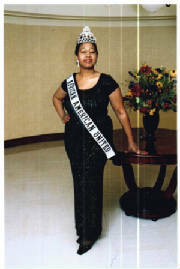 2.Interview: How would you unify African-American females in your state if choosen the state representive. City/County delegates who do not advance as the state winners may enter the National MAAU pageant, however they must reapply as an "at-large" delegate. They must also pay the National entry fee. *All delegates are judged equally. Title selection has NO OUTCOME of Natioanl Winers. City/County delegates who do not advance as state winners will carry the city/county title for one year from when the winners are announced after which point the title will be null and void. State Winners may not reapply from year to year for the state that they won, however they may apply "at-large" for a regional title. They must pay the National fees. Disclaimer: If a state prelim is not held former state titleholders may apply to represent that state with approval from MAAU Staff. All Decisions are Final and NO REFUNDS will be given. MAAU(TM) is an online pageant.